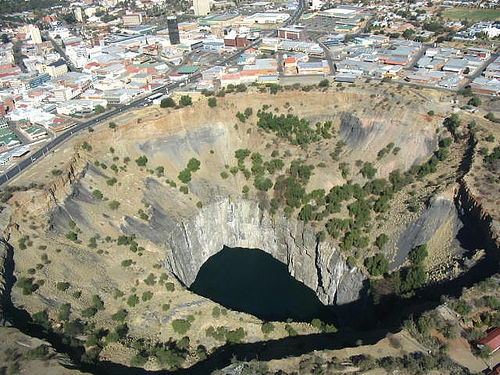 Apparently the largest ever hand-dug excavation in the world, this 1097 metre deep mine yielded over 3 tons of diamonds before being closed in 1914. 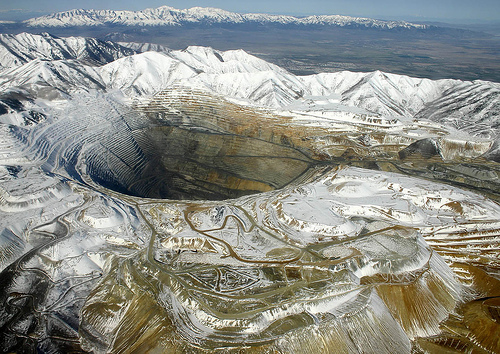 It is estimated that a total of 22.5 million tons of earth was removed by workers. 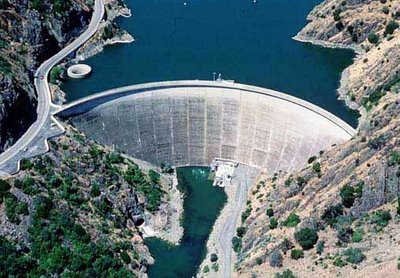 A glory hole is used when a dam is at full capacity and water needs to be drained from the reservoir. 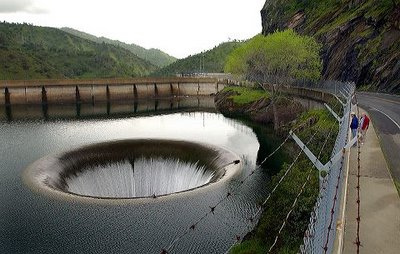 The glory hole belonging to Monticello dam in California is the largest in the world, its size enabling it to consume 14400 cubic feet of water every second. The hole can be seen at the top left of the photo above. 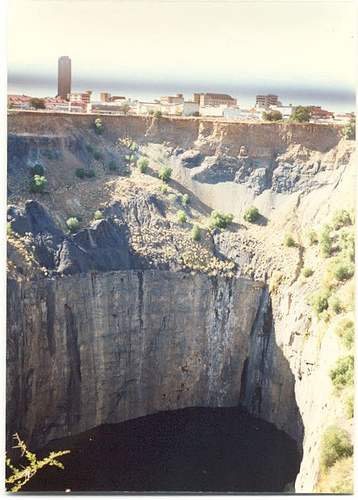 In the original email from which I extracted these pictures the accompanying text read "if you were for some reason to jump in your somewhat damp body would shoot out in the jet at the bottom of the dam" but in July 2010 a Bryan Teel emailed to point out that the exit of the gory hole is actually the dark hole in the canyon wall at the left of the left-hand picture above. 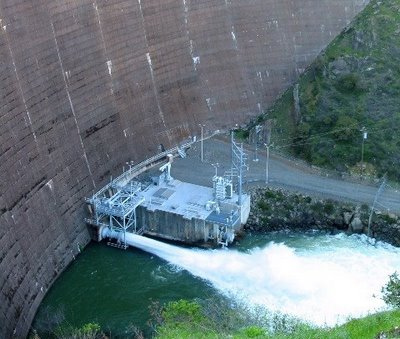 The photograph was evidently taken when the dam was less full and the water level is below the rim of the glory hole and therefore no water is leaving the exit; apparently skateboarders and cyclists like to play in the exit chute when it is dry. More photos and information on the Davis wiki and at Foganazos. 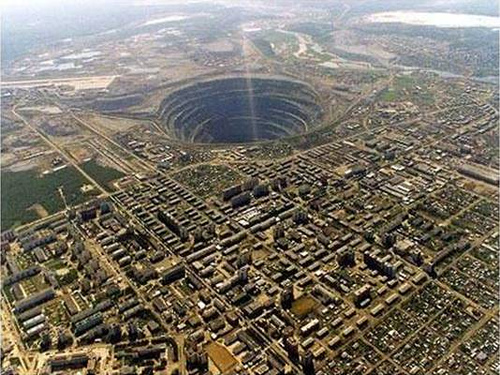 This is supposedly the largest man-made excavation on earth. 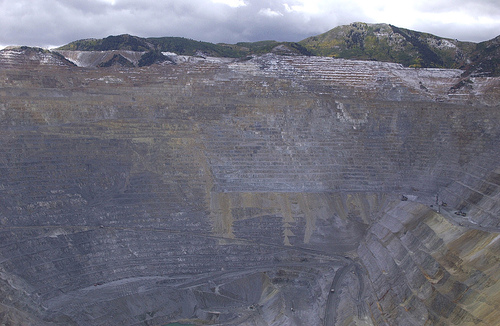 Extraction began in 1863 and still continues today, the pit increasing in size constantly. 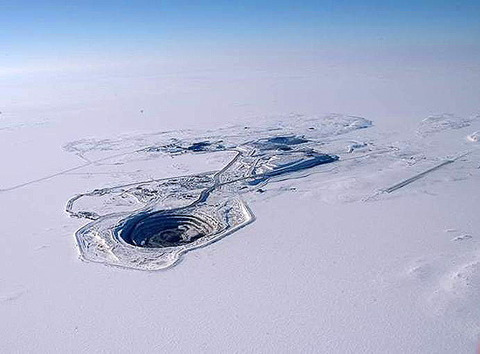 In its current state the hole is 3/4 mile deep and 2.5 miles wide. 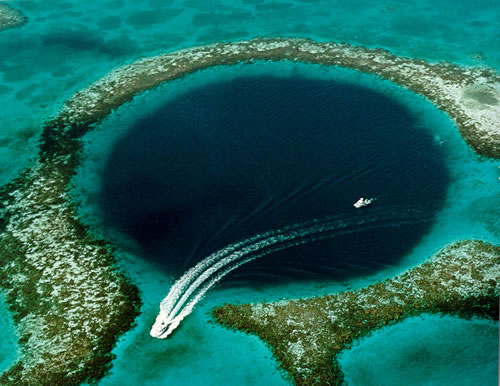 Situated 60 miles off the mainland of Belize is this stunning geological phenomenon known as a blue hole. 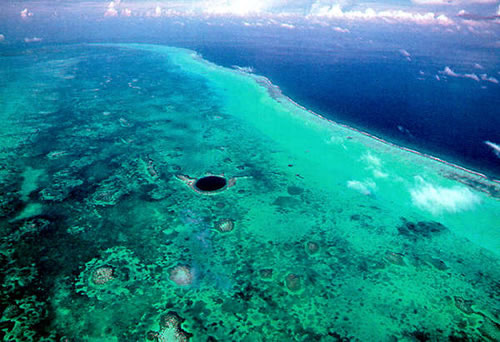 There are numerous blue holes around the world but none as fine as this one. 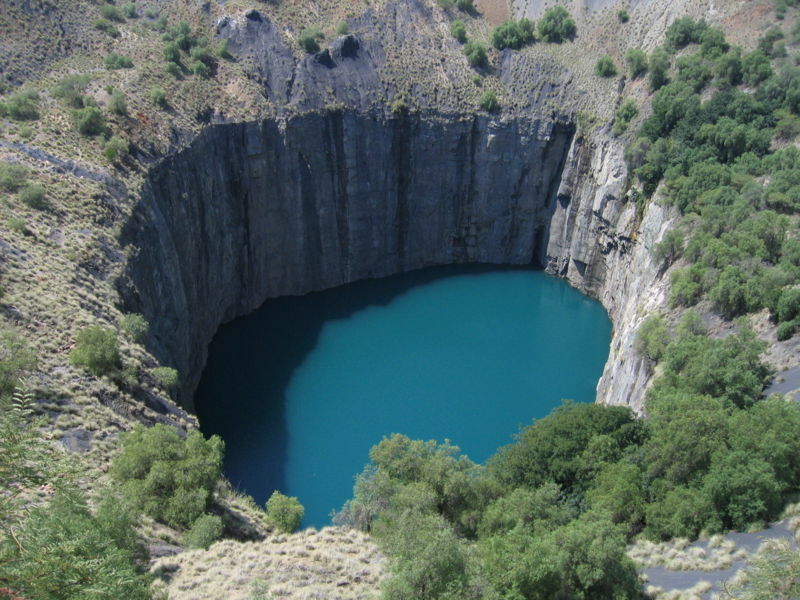 At surface level the nearly perfectly circular hole is 1/4 mile wide with the depth in the middle reaching 145 metres. The hole is a huge hit with divers. 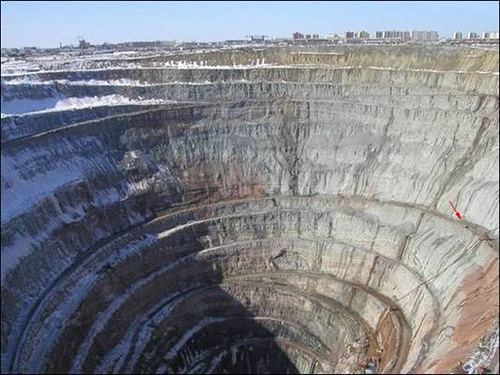 Supposedly the largest open diamond mine in the world at 525 metres deep with a surface diameter of 1200 metres; there's even a no-fly zone above the hole due to helicopters reportedly being sucked in. The red arrow in the photo below is pointing to a huge truck. 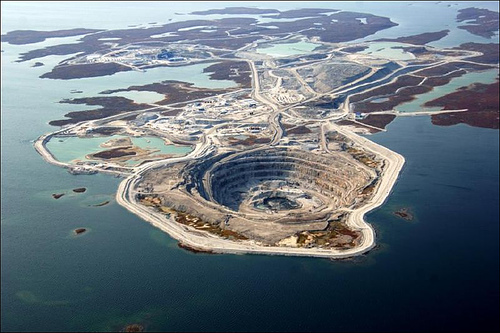 This mine is 300km northeast of Yellowknife in Canada. 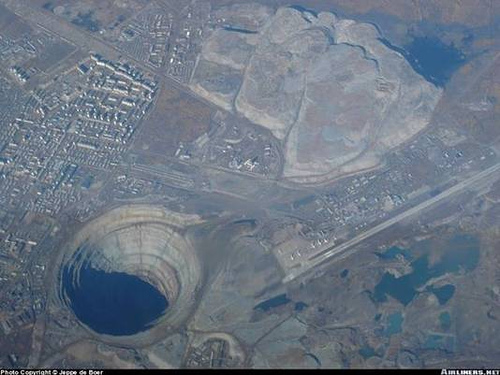 The mine is so huge and the area so remote that it has its own airport with a runway large enough to accommodate a Boeing 737. It also looks remarkable when the surrounding water is frozen. 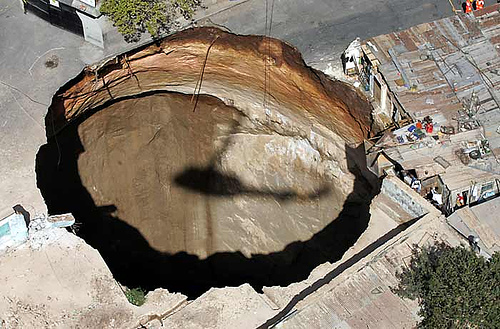 A sinkhole is caused when water (usually rainwater or sewage) is soaked up by the earth on a large scale, resulting in the ground collapsing. 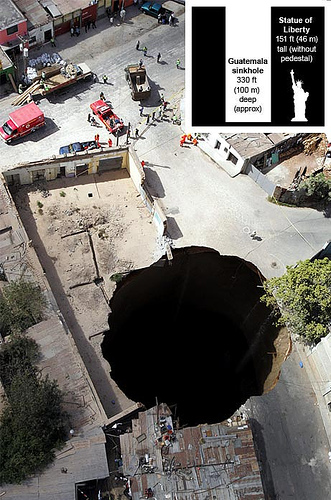 These photos are of a sinkhole which occurred in Guatemala. 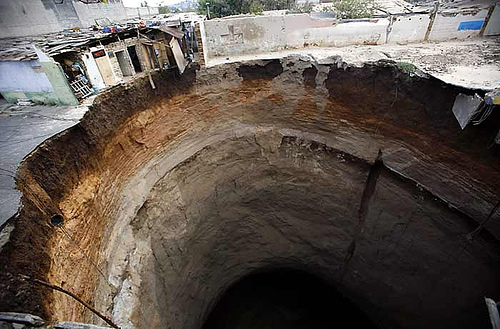 The hole swallowed a dozen homes and killed at least 3 people. 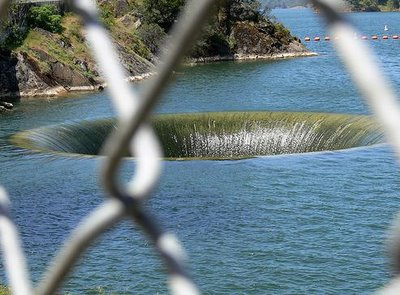 Officials blamed this monster hole on a ruptured sewage pipe. If you like this page please feel free to link to it. I will maintain the same URI: http://stumbles.org.uk/John/rec/holes as along as I am able to maintain the page (as per the recommendations of that nice Mr Berners-Lee). If you like the pictures please do not link to them: copy them onto your own webserver (or some picture hosting site) and serve them from there. I pay for my hosting and I choose not to pay to serve images for others' sites! From your point of view you probably want whatever you've put up to look as though you know what you're doing: if you are dependent on my web host working, my site still being up and whether I've maintained the same URIs for the pictures here then your hard work and reputation as not-a-lame-n00b is vulnerable to the whims of others!